Live in comfort with the Graeme 6, 6-inch tall men's boot. 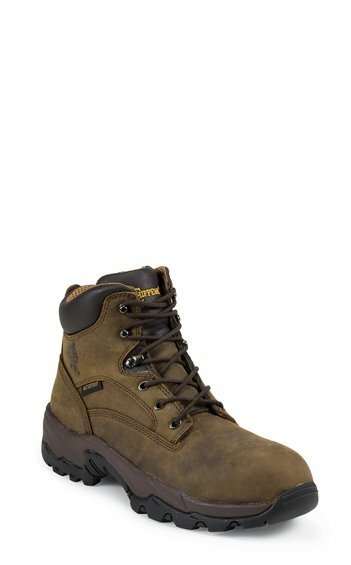 The rugged brown leather exterior is waterproof with a seam seal construction so you can take this boot anywhere and its Texon® Flexwelt® insoles offer lasting support and a flexible fit for freedom of movement. The fiberglass shank allows for stability on various terrains and the rubber outsole is durable no matter the environment and guarantees traction even in the roughest conditions. This is one great boot!! I bought this boot over a year ago. This is the first pair of Chippewa boots I have owned. The boots are very conformable and light weight. I bought them to wear working in the yard and hunting. These are very nice boots and made to last. The next time I shop for foot ware Chippewa is on the top of my list! I have been wearing this boot for about 5 years. Light weight and comfortable these wear great and last! !